Prefix registrations were introduced after the previous registration system (suffix registrations) came to an end. Prefix registrations were issued between 1983 and 2001. Search prefix registrations - pick a prefix letter, a number and three more letters. When Exactly Were Prefix Registrations Issued? Prefix registrations began with the letter 'A' and were first issued on August 1st, 1983. The leading letter (the prefix) is the year identifier on the registration, followed by one, two or three digits with three additional letters completing the registration. These final three letters are not actually random, but identified the original location of issue of the registration. For example "LHN" indicated Darlington. The 'A' series ran until 31st July, 1984, where it was then followed by 'B'. A new prefix registration letter continued to be issued annually right the way up to the 'R' series. What Happened to Prefix Registrations Then? 'S' prefix registrations were issued as usual on 1st August 1998 but finished on 25th February 1999. 'T' prefix registrations were issued on 1st March 1999 and ran until 31st August 1999, with 'V' prefix registrations beginning on 1st September 1999. The system continued in this way until the 'Y' prefix registrations finished at the end of August 2001. Were All Letters Used in Prefix Registrations? The following letters were never used: I, O, U, Q or Z. This was for various reasons, namely the 'I' and the 'Z' were letters reserved for Northern Ireland, the 'O' was thought to be too easily confused with the number zero, and the 'U' was difficult to distinguish from a 'V'. The 'Q' was used in special cases to register vehicles where the year of manufacture was unknown. What Year Were Prefix Registration Letters Issued? This table shows the year of issue for each prefix letter. Why Were Prefix Registrations Issued Twice a Year from 1998? The pressure put on both the motor trade and the local registration offices on August 1st every year was tremendous. By issuing prefix registrations twice a year, the bottleneck of having a single day for a rush of new registrations was somewhat alleviated. A side effect of this was that prefix registrations were used up more quickly, making the introduction of the millennium registration system necessary in September 2001. DVLA had the vision to withhold the numbers 1 to 20 from general issue when the prefix registrations A, B, C, D, E, F, G and H were issued. By 1991, when the 'J' prefix registrations were issued, DVLA also withheld further attractive numbers like 22, 33, 44, etc; 100, 200, 300,etc; 111, 222, 333 etc. which they would later start making for sale rather than being standard issue. 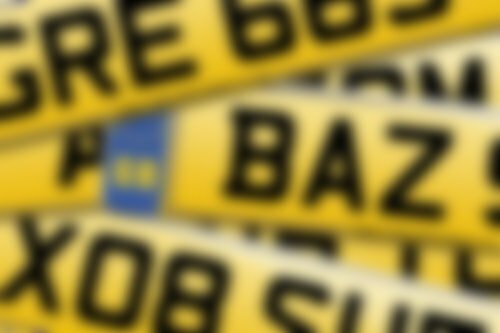 Many of these plates were very reasonably priced, and are responsible for powering a big surge in interest of personalised registrations. Not all withheld prefix registrations would be released in this fashion, however. Some that clearly spelled names or words would be reserved and sold through auction. Others still would be given special release days where a range of previously un-issued numbers would be made available (first come, first served) many years after the prefix letter had originally been issued.